Courtesy of RHP Real Estate. **COVETED ARROWHEAD RANCH** INTERIOR FEATURES INCLUDE TRAVERTINE TILE & ENGINEERED WOOD FLOORING, GRANITE C/TOPS, VAULTED CEILINGS, UPDATED CABINETRY W/SELF-CLOSING DRAWERS IN KITCHEN, BREAKFAST BAR, BAY WINDOW IN DINING SPACE, BLACK & STAINLESS APPLIANCES, INSIDE LAUNDRY W/PANTRY SHELVING, FOCAL-POINT FIREPLACE IN FAMILY ROOM, HALF BATH DOWNSTAIRS, UPSTAIRS LOFT, DUAL SINKS IN GUEST BATHROOM + TILED SHOWER SURROUND, TWO-TONE PAINT, 6-PANEL DOORS, MASTER SUITE DOWNSTAIRS W/WALK-IN CLOSET, DUAL SINKS + MAKEUP COUNTER & DOOR TO BACKYARD. OUTSIDE YOU’LL FIND AN RV GATE W/AREA FOR PARKING BEHIND, SPARKLING BLUE (HEATED) SWIMMING POOL W/BASKETBALL HOOP, HOT TUB, COVERED PATIO & GORGEOUS SUNSET VIEWS OVER THE GOLF COURSE! DESIRABLE SCHOOLS, RESTAURANTS, SHOPPING & NIGHT LIFE CLOSE BY. Approximate size: 6400.00 sq. ft. Please, send me more information on this property: MLS# 5910188 – $385,000 – 19016 N 71st Drive, Glendale, AZ 85308. 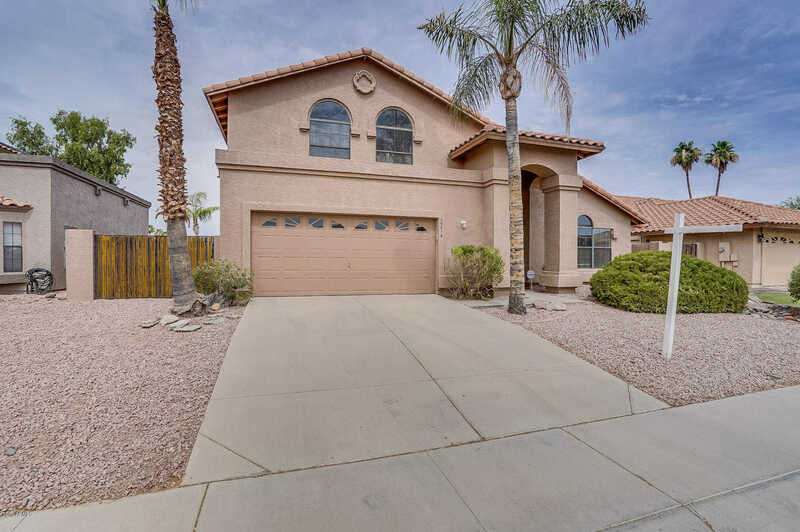 I would like to schedule a showing appointment for this property: MLS# 5910188 – $385,000 – 19016 N 71st Drive, Glendale, AZ 85308.